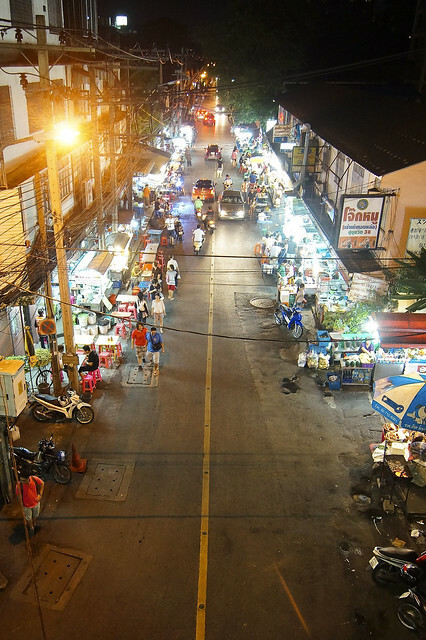 Sukhumvit Soi 38 is an ordinary road by day and transformed into a food street by night. 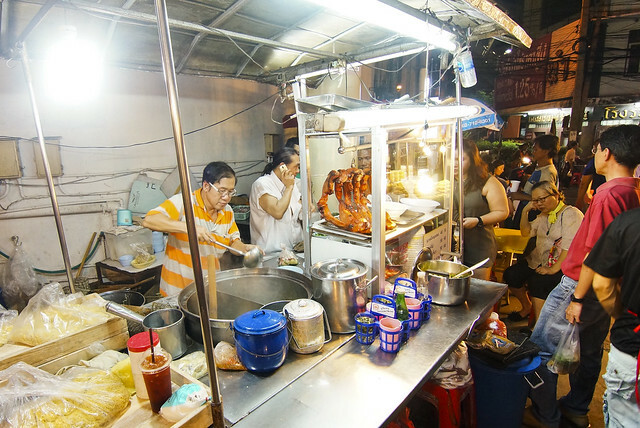 There are about twenty stalls here that offers quite a variety of Bangkok street food here like Papaya Salad, Skewered BBQ Meat, Duck Noodle, Fresh Fruit Smoothies, Pad Thai, the famous Mango Sticky Rice and Thai-style Wanton Noodle. Sukhumvit Soi 38 is directly across Thong Lor BTS station Exit 4. Apparently the Pad Thai there has quite some reputation but we did not have the stomach after having the famous “Best Bangkok Mango Sticky Rice” and the Thai-style Wanton Noodle. I always wanted to do a comparison between the SabX2 Wanton Noodle and something else so this is the one. 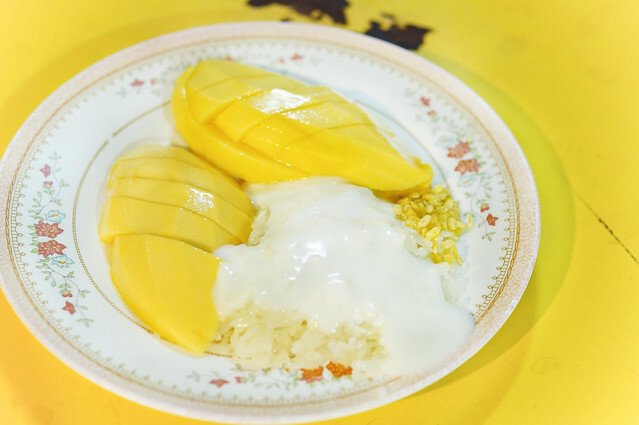 Everyone surely will have a mango sticky rice or two in Bangkok, but what about the “Best Mango Sticky Rice”? Apparently, the one with such reputation is not from a restaurant, not from an eatery and definitely not from a cafe but this road side stall at Sukhumvit Soi 38. Turn right at the blue and white umbrella at the foreground as shown in the above pic to locate this stall. Remember it’s something something something 38. LOL. Any helpful soul to translate? I was pretty curious what actually contributed to this roadside stall for their “Best Bangkok Mango Sticky Rice” reputation. I can’t be sure is this the Best Mango Sticky Rice, but this is one of the best i had so far. I had reviewed Mango Tango previously and talked about how fresh and sweet their mangoes are, surprisingly, this street food stall’s are as good, if not slightly better. But i have to emphasis that it’s still a personal preference for individual’s criteria for a “good mango sticky rice”. Some mango sticky rice’s are good for their coconut sauce while the glutinous rice don’t add much flavor to the overall taste except for it’s texture. This glutinous rice is flavorful, with sweet blend of slightly salty and sweet taste and the aromatic coconut sauce completes the whole package. Good mango, good coconut sauce, good rice and a bonus – good price. 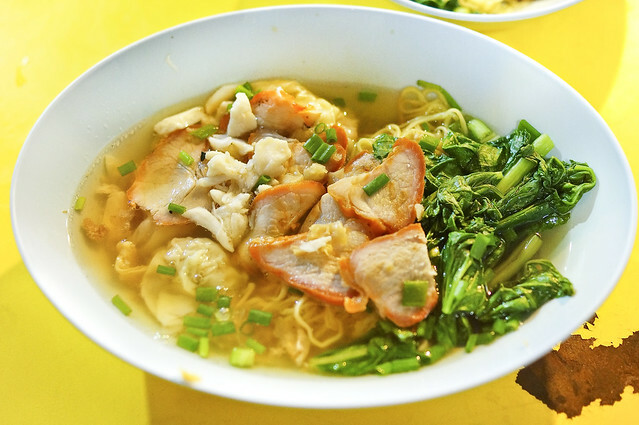 Apparently the wanton noodle is one of the popular stalls which has quite some good reputation online. 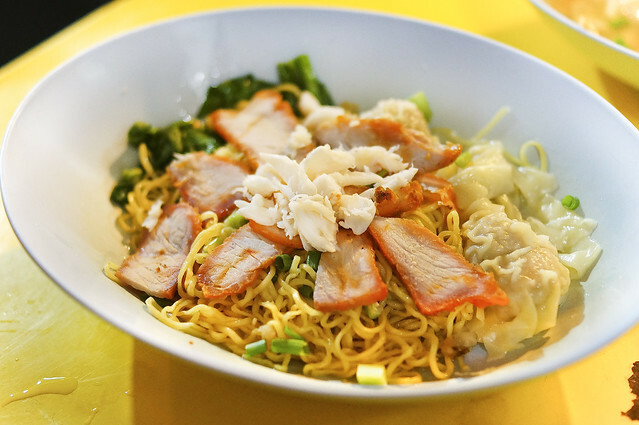 The unique thing for this Thai-style wanton noodle is they added fresh crab meat as the ingredient. I can’t remember the exact price but i remember it is not expensive at all. There is a good local crowd queuing at this stall when i visited. The noodle dry is springy and the texture is quite delightful. There is a tinge of shallot and pork lard fragrance upon having my first bite. The fresh crab meat don’t exactly affects the taste much but is a nice addition to the ingredient. Unlike the Sabx2 Wanton Noodle ,this noodle is less flavorful and i can taste the sweetness of the noodle. I would like this version if i am looking for something lighter, but I thought that the SabX2 Wanton Noodle fairs better than this in term of the overall taste. The soup is also lightly flavored by the Chye Poh (preserved radish) and the soup is pretty good and i actually prefers the soup version to the dry. I normally prefers a dry noodle over a soup noodle anytime but not this one. This is my first visit to Sukhumvit Soi 38 but definitely will not be my last. 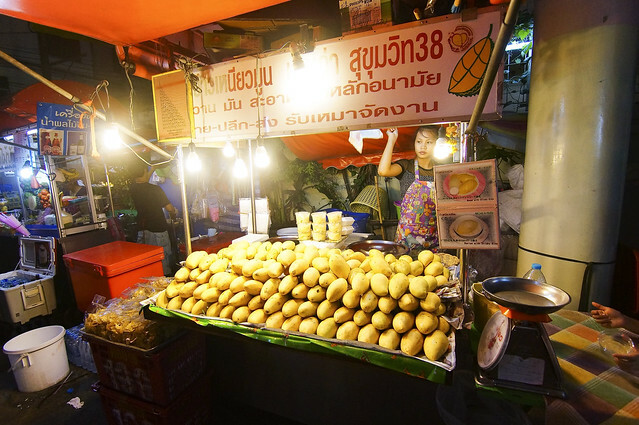 I thought it is an awesome place to indulge in Bangkok’s Street Food Culture to try out the wide variety of street food here. I would love to try out the Pad Thai and it’s a pity i didn’t have it for my last visit. If you are visiting here, don’t be like me, for visiting this place with an almost-full stomach.